I have a love hate relationship with chicken. I’ve told you guys before that I’m picky about the texture and taste of chicken. If I get a gristly bit or it tastes too chicken-y then I’m grossed out and chicken goes on to my “foods I hate” list. If the chicken can behave itself then everything is right in the world. Lately, I’ve had no weird chicken aversions so I’m loving chicken. (Boy, it’s not often that I say that). 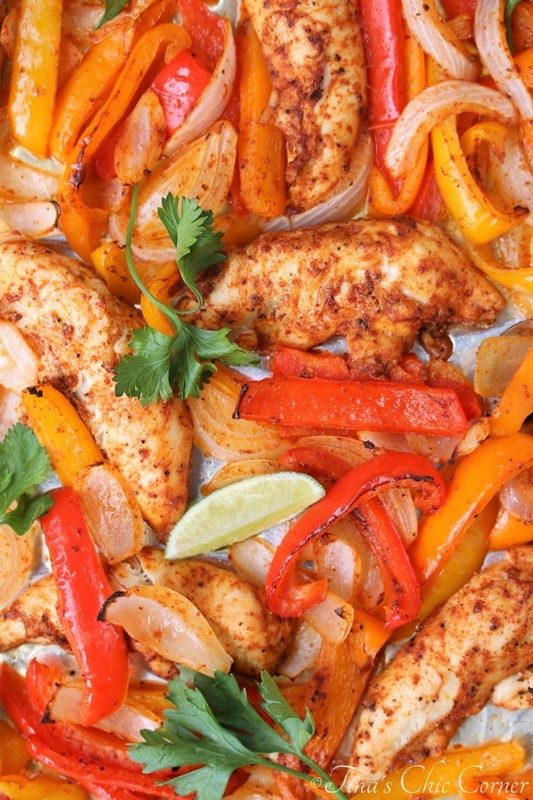 That means that I’m taking advantage of this happy with chicken situation and making a lot of recipes, like these fajitas. This is a great meal to make on a weekday. I can prep everything during the time it takes for the oven to heat up. Everything goes on the sheet pan. 20 to 25 minutes later, boom, dinner is ready. You don’t even have a lot of pots and pans to wash afterwards, too. I don’t know about you, but that’s an important thing to me, especially at the end of a long work day. My husband and I enjoyed the chicken and veggies on flour tortillas because that’s how you are supposed to eat fajitas. Feel free to load up on the extras, like sour cream, cheese, lettuce, tomatoes, guacamole, salsa… you get the idea. 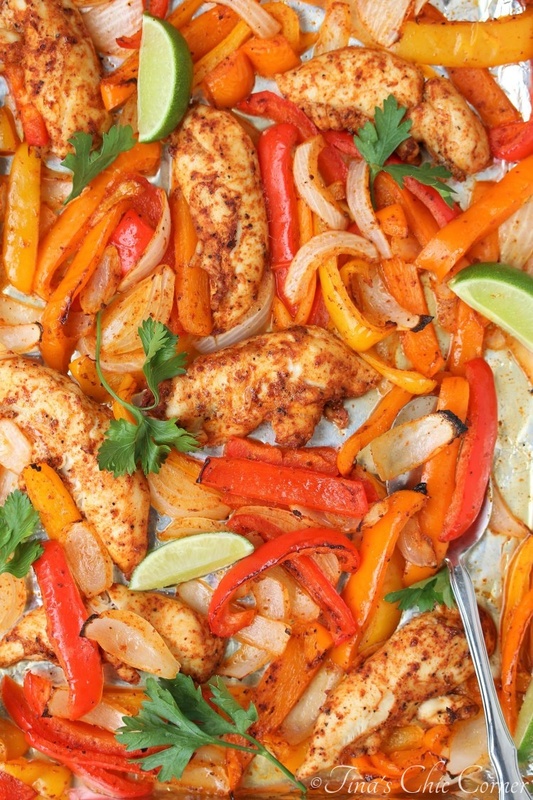 I would also call this recipe “sheet pan chicken and veggies with Mexican spices” and place everything over a pile of rice but my husband would laugh about the title being way too long. I’m all about taking the same recipe and giving it a twist to make it seem like a completely different meal, especially if you have leftovers. A great example was the rice my husband made that unceremoniously had the left over fajita fillings stacked on top. 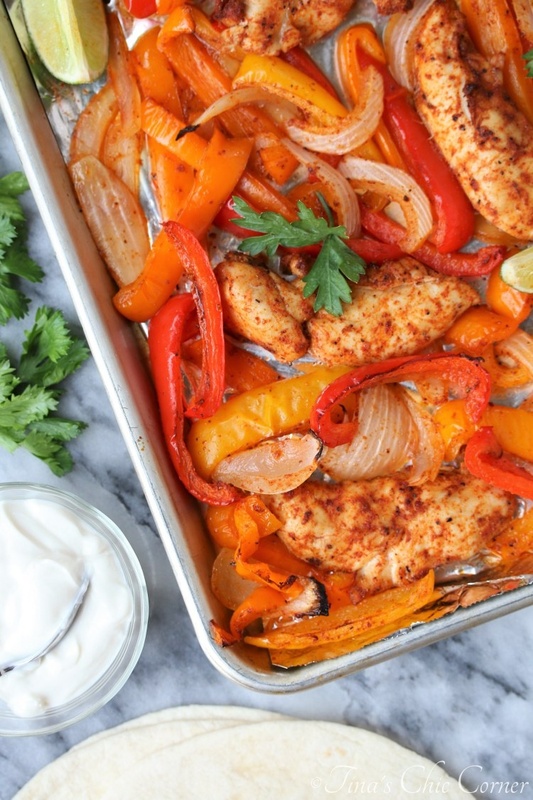 Line a sheet pan with tin foil (you’ll thank me later for the easy clean up). Set it aside. In a large bowl, add the chicken, sliced bell peppers and onions, olive oil, salt, pepper, chili powder, garlic powder, onion powder, ground cumin, and smoked paprika and mix together well so that everything is coated in the lovely spices. Transfer everything to the prepared cookie sheet and spread it out into one layer. Cook for 20 minutes or until the chicken is done cooking. Remove the chicken from pan. This isn’t strictly required, but it does help to avoid over cooking the chicken while you roast up the veggies. Then turn the oven to broil for another 2 to 4 minutes, or until the tops of some of the veggies have toasted to your liking. Make sure to watch the food at this point because it can go from delicious food to charcoal in seconds. Serve with a squeeze of lime juice and sprinkling of cilantro. This looks very easy to make and fast too. I think I’ll make this for my grandchildren when I visit them next. Thanks, Tina for the quick sheet pan dinner.